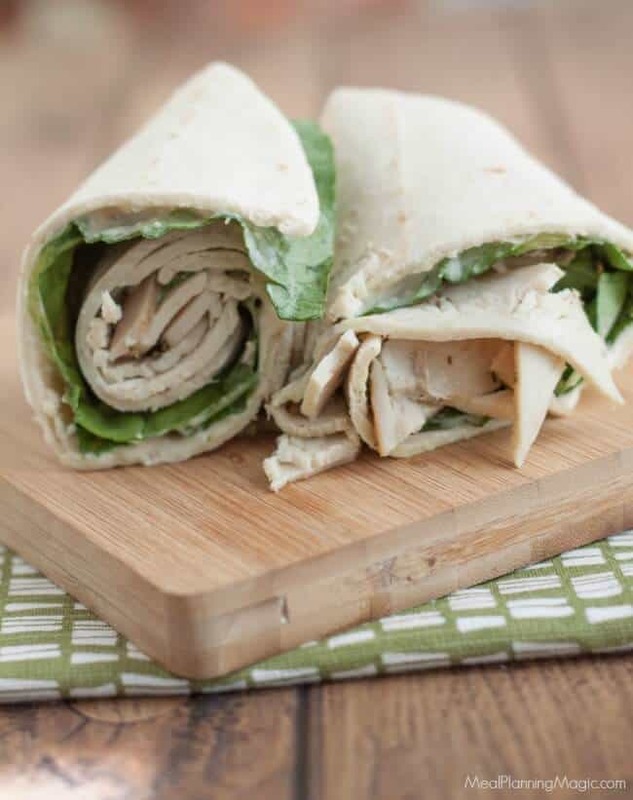 This chicken Caesar salad wrap is a delicious sandwich wrap combining chicken lunch meat with a fresh Caesar salad! Perfect make ahead meal for lunch boxes or an easy dinner. This post originally appeared here more than five years ago! I’ve updated the photos and the post just a bit to share it with you again. It’s such a simple lunchbox idea that I hope you like it as much as we do! This is the third and final week for The Mom 100 Cookbook series for Sunday Supper. I have gotten a ton of great new ideas and I hope you have too. In June, I made the Turkey Meat Sauce Lasagna from Katie Workman’s cookbook. It has become a new favorite for our family! And last month I featured my twist on quesadillas with the Pizza Quesadillas. These are fast becoming a staple in our house it seems. This week we’re talking about back-to-school recipes! Why does it seem that the summer always flies by? I can’t believe my own kids have only a couple of more weeks left until school starts. And every year seems to be a little bit different, with a new routine to get used to. I know I sure can use all the help I can get, with new recipe ideas that are quick, easy and most importantly, delicious! This week, I did a variation on the wraps section of Workman’s book. 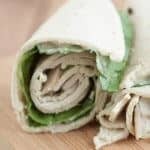 We love Caesar salads topped with chicken so when I discovered a similar chicken Caesar salad wrap at our local grocery store I had to try it! It was delicious and I thought to myself, this would be so easy to make for lunch for our own lunchboxes. 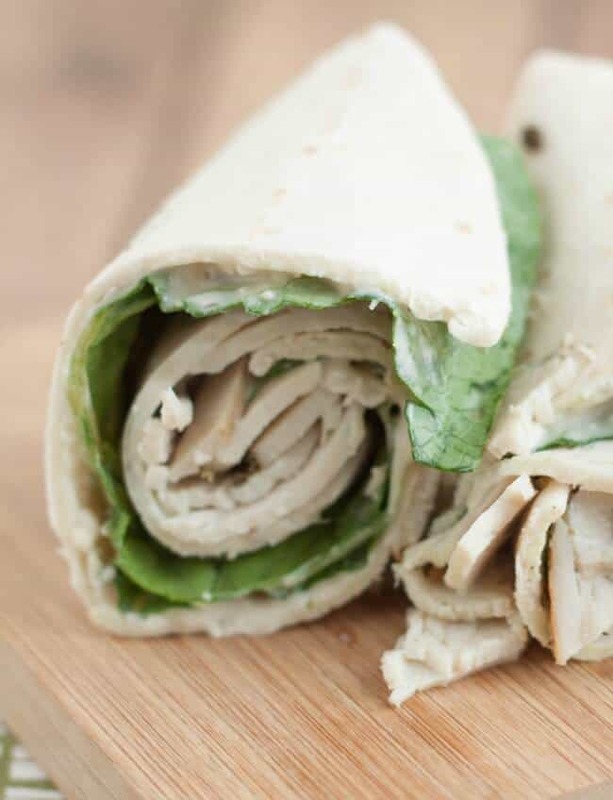 My daughter especially loves this chicken Caesar salad wrap! The store-bought variety has a bit more lunch meat than we like, so that’s what is great about making our own…we can totally customize it. And that’s the tip that Workman gives…customize a wrap to make it your own! 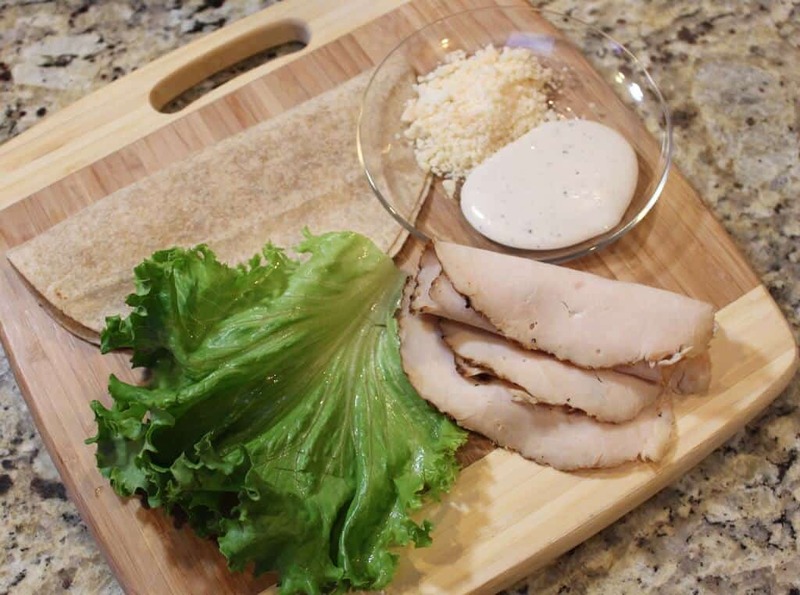 The chicken Caesar salad wrap is pretty simple to put together and best of all, you can make them the night before! Store in the refrigerator to put into a lunch tote before heading to school or work. I also grate my own Parmesan cheese for these easy chicken wraps–you can find out how by checking out my post here. Yum! 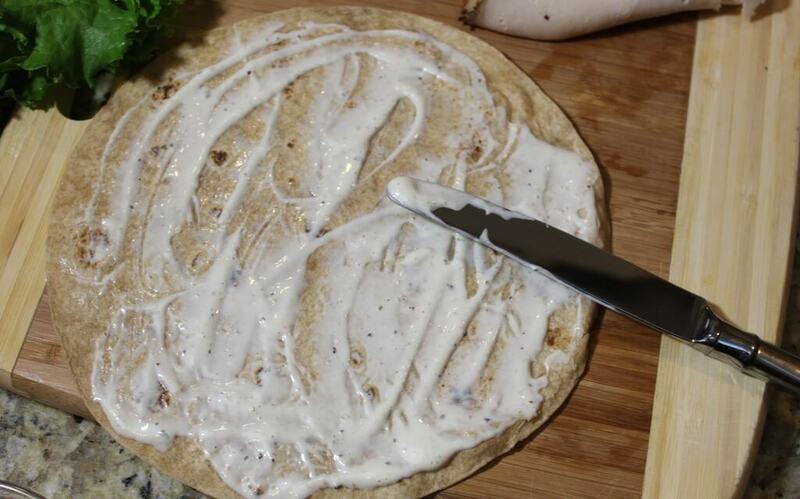 Spread dressing on entire tortilla. Sprinkle with paremesan cheese. Layer lettuce on tortilla and top with chicken slices on two-thirds of tortilla. Roll up one side then roll all ingredients up and secure with a toothpick if necessary. Enjoy! 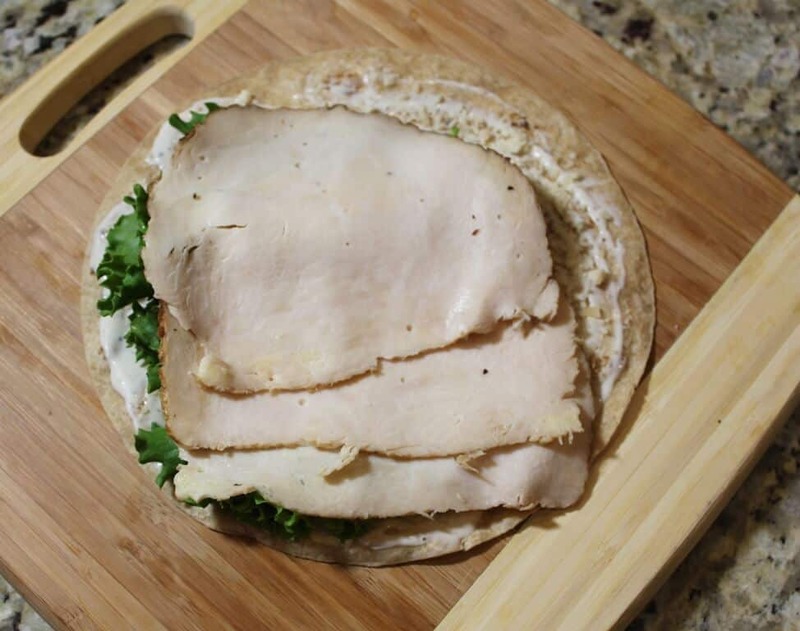 Just a few simple ingredients is all it takes to whip up this tasty chicken wrap! Spread the dressing on the tortilla first–then sprinkle on the cheese. Layer everything on the tortilla–I kind of shift it to one side a bit (which this picture doesn’t really show but I do do it). If you’re looking for some ideas to help you get family-friendly meals on the table this year, then be sure to check out The Mom 100 Cookbook. You can read my review of it here–it really is a great resource for tons of great recipes. Or check out the author’s blog for even more tips and recipes to get you started. Lastly, be sure to join us this Sunday for #SundaySupper Around the Family Table with Katie Workman at 7pm ET. Katie is so much fun and will be sharing her Easy Back to School Recipes during our chat. And many thanks to Isabel at Family Foodie for starting the #SundaySupper movement and getting us all talking and sharing. 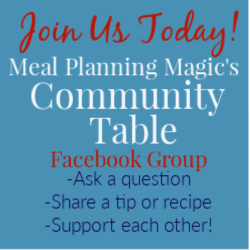 We’d love for you to join us and share your tips and inspiration. Let’s make this the best school year yet for our kids! In addition to the chicken Caesar salad wrap recipe, here are easy back-to-school recipes from the rest of the Sunday Supper members. Disclosure: I have received a copy of The Mom 100 Cookbook and am an Amazon Affiliate (if you order a book from my site, I get a very, very small percentage). All opinions are my own! I love Caesar Salad and never thought to make it into a wrap! Thanks for the inspiration. I can’t wait to try it! This is one of my favorite wraps of all time! It’s so fresh and tasty-your version look delish! My all time favorite wrap. We have been eating them a lot using thin pita instead of tortillas. I can buy them fresh and local, they are so delicious. Yum! I love caesar salad and would love this wrap! I love chicken caesar salad, so I can see this being my new addiction. It looks so easy to make and great for an on-the-go meal. Happy #SundaySupper! I always order Chicken Ceasar Wraps at the local diner. These sound great! Happy #SundaySupper! This is one of my favorite flavor combos – I could go for one right this minute actually! Your wraps look fabulous. I love the idea of using deli meat for the chicken! This is one of my favorite wraps to make I can’t wait to try it this way! Thanks for sharing! GREAT! simple and doesn’t require cooking in this Texas Summer Heat! Wow!! This sounds so so yummy! Nice idea. Thanks a lot for sharing. Ceaser salad wraps? Oh, I’m gonna have to try these myself. They must be so delicious! !